NETWORK UPDATE: NBC’s NHL PLAYOFFS game adjusted to 1.5, and FOX’s regional MAJOR LEAGUE BASEBALL coverage adjusted to 0.4 nationwide. CABLE HIGHLIGHTS: Lifetime’s MARILYN: THE SECRET LIFE OF MARILYN MONROE led Saturday cable at 0.50, and its BEYOND THE HEADLINES follow-up was close behind at 0.42. 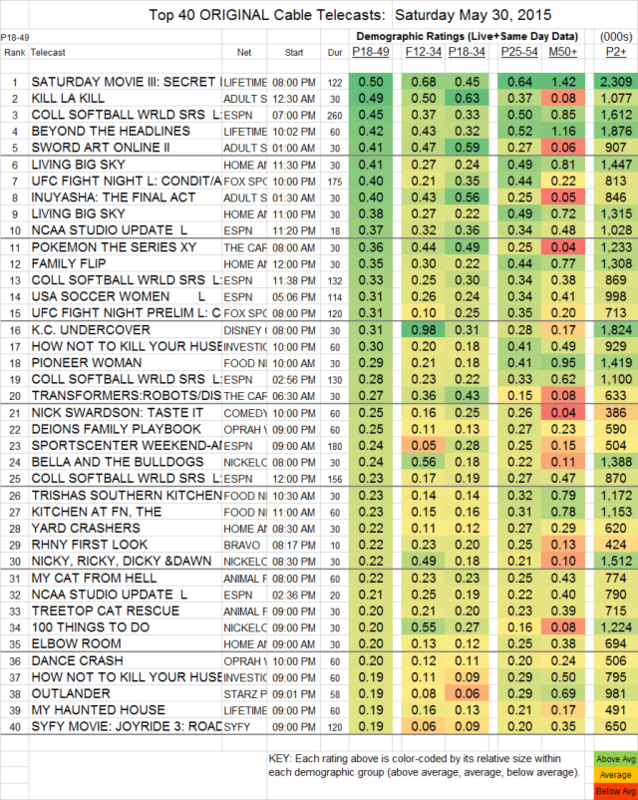 Adult Swim’s late-night line-up returned solidly after skipping last week, with KILL LA KILL at 0.49 (down a hundredth from 2 weeks ago), SWORD ART ONLINE at 0.41 (up 0.03) , INUYASHA: THE FINAL ACT at 0.40 (up 0.05), and (not on the chart, because it’s technically a rerun, although it hadn’t aired in the current form before in the US) DRAGON BALL Z at 0.62 (up an impressive 0.25). The leading sports programming was ESPN’s COLLEGE SOFTBALL WORLD SERIES at 0.45 (0.33 for late-night coverage), and Fox Sports 1’s UFC FIGHT NIGHT was at 0.40 (0.31 for PRELIMINARIES). The NICK SWARDSON: TASTE IT special on Comedy Central was at 0.25. The season finale of Starz’s OUTLANDER fell 0.05 to 0.19 after having taken the preceding week off. ORPHAN BLACK (BBCAmerica) was steady at 0.10. HBO’s ROCK & ROLL HALL OF FAME INDUCTION CEREMONY was at 0.17, with 665K total viewers.